America’s Cup-winning skipper Glenn Ashby and rising RPAYC stars Natasha Bryant and Annie Wilmot were named the nation’s top sailors for 2017 at the Australian Sailing Awards in Sydney on Friday night. 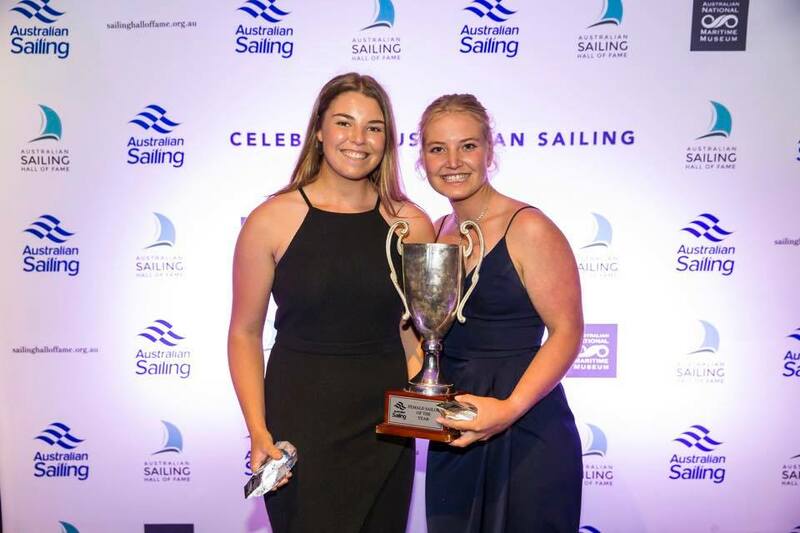 Ashby was crowned Male Sailor of the Year and Natasha and Annie won Female Sailor of the Year at a festive ceremony which celebrated Australian Sailing’s diverse strengths. The awards were held in conjunction with Australian Sailing’s inaugural Hall of Fame Inductions, which includes such Pittwater legends as Kay Cottee, the Team of Australia II, Daniel Fitzgibbon OAM and Liesl Tesch AM, and Victor Kovalenko OAM, the brilliant coach who has inspired and guided local Olympic medal winners. Ashby was rewarded for his expertise in guiding Emirates Team New Zealand to a comprehensive 7-1 series win over Oracle Team USA in the 35th America’s Cup, in Bermuda in June. It was the latest and perhaps greatest of Ashby’s illustrious achievements, which include a silver medal at the 2008 Olympic Games and 15 World Championships across three multi-hull classes. “It’s been a fantastic evening here in Sydney and I’m very humbled and honoured to receive the Australian Sailing Male Sailor of the Year,” Ashby said. Ashby was last month named as one of four finalists in the prestigious Rolex World Sailor of the Year, which will be announced at the World Sailing Awards Ceremony in Puerto Vallarta, Mexico, on Tuesday. Bryant and Wilmot have it all ahead of them, but they were recognised for their outstanding performance in winning the Youth World Sailing Championship in the 29er class in New Zealand last December. In a remarkable display of dedication to representing Australia at a higher level, the duo later declared they would not defend their world title in China this year and moved into the Olympic class 49er in order to focus on securing a coveted place on the Australian Sailing Team for the Tokyo 2020 Games. “We’re really honoured to be receiving this award and we’d really like to thank [2016 Olympic silver medallist] Lisa Darmanin for all that she’s done for us and all her mentoring,” Bryant said. Wilmot thanked the many people she said had supported the pair, including their families and coach, Traks Gordon. “Tonight has been amazing, being in this room with all these legends, it’s just so inspiring for the young generation out there,” she added. Another high achiever at junior level, Finn Alexander, was named Youth Sailor of the Year after he convincingly defeated a strong fleet to win the Laser class Youth World Championship. Alexander has developed rapidly since then and captured a first-placing and fifth overall at the Australian Laser Championships after returning from New Zealand. “I’m really stoked to pick up Youth Sailor of the Year against a really competitive bunch of young athletes,” Alexander said. “I’ve now fully launched into the Laser standard campaign, I’ve been racing overseas across this year and it’s been really good, learning a lot and making lots of improvements." Rio Paralympic silver medallist Matt Bugg was named Sailor of the Year with a Disability after snaring a silver medal in the 2.4mR class at the Para World Sailing Championships in Germany in June. Bugg had earlier won the 2.4mR Australian Championship and was named Tasmanian Athlete of the Year by the Tasmanian Institute of Sport. Bugg was part of the triumphant Australian Paralympic team which last year was named a group winner of this award. In other awards, David Kellett AM received the Lifetime Achievement Award for his tireless dedication to participation in sailing, improving the sport’s competitive infrastructure and service to its administration. Kellett was vice-president of World Sailing between 1998 and 2008 and was involved in the management of sailing regattas at four Olympic Games. He has competed in 41 Rolex Sydney to Hobart Yacht Races and been involved in three America’s Cup campaigns for Australia. The CYCA SOLAS Trusts Bravery Award went to 18-year-old Simon Hoffman for his crucial role in saving the life of Irish competitor Johnny Durcan at the 29er World Championships in California in August. After hearing screams from an overturned boat, Hoffman jumped into the water, swam over and freed Durcan from a tangle of ropes. He then performed CPR on Durcan, who was unconscious, eventually reviving the 17-year-old. “He is the reason I’m alive to write this”, Durcan wrote in a message to Australian Sailing. Nicole Douglass took out the Sport Promotion Award for the second year running after she continued to expand her multi-platform communications coverage, Adventures of a Sailor Girl. Through her incredible enthusiasm and hard work, including travelling to 30 international events this year, Douglass has brought sailing to millions of people. RPAYC Members Lisa Ratcliff and RPAYC were both finalists and recognised for their outstanding support and promotion of Sailing. RPAYC's Head Coach Thomas Spitill took out this year's Coach of the Year award continuing his winning streak from the top award at the YNSW awards. Tom was recognised for this dedication to the sport of sailing across all aspects of coaching, learn to sail, development, performance and especially for introducing and integrating non sailors into the sport, through his support of Soldier On, the Invictus Games and many other community groups. Established earlier this year by Australian Sailing in collaboration with the Australian National Maritime Museum, the Australian Sailing Hall of Fame will recognise the greats of the sport of sailing – those who have inspired many and contributed so much to make the sport what it is today. A panel exhibition celebrating the greats of Australian Sailing. Opens 4 November 2017 – 31 January 2018 at the Australian National Maritime Museum.